Americans remain panicked by insurance uncertainty and a president with no credibility. Last Thursday, in an effort to extricate himself from the political consequences of repeatedly and shamelessly lying to the American public, President Obama proposed a "fix" to ObamaCare. "Insurers can extend current plans that otherwise would be canceled into 2014 and Americans whose plans have been canceled can choose to re-enroll in the same kind of plan," the president said. "This fix won't solve every problem for every person, but it's going to help a lot of people. Doing more would require work with Congress," he added, again dismissing the legislative branch of government as an unnecessary impediment to implementing his agenda. Unfortunately for millions of Americans, the fix is as disastrous as ObamaCare itself. And that's assuming it's legal to begin with. What the president has done is issue a "waiver" to insurance companies based on the doctrine of "prosecutorial discretion" that allows him to selectively enforce laws. Yet as National Review's Andrew McCarthy points out, that doctrine is one of "allocation," based on the notion that government's ability to enforce every law equally is constrained by finite resources. Yet there is no allocation of resources issue with regard to government here. It is insurance companies who have been tasked with re-allocating resources to accommodate this decision. The reason for that is obvious: once again, this president is attempting to deflect his failures onto someone else. In his typically cynical calculation, he is betting that if insurance companies and the state commissioners who regulate them fail to make this latest adjustment, the public with blame them, not him. Robert Laszewski, a prominent insurance industry consultant with Health Policy and Strategy Associates, illuminated the consequences for those states and insurance companies willing to comply with Obama's directive. "It's a logistical nightmare that if done is likely to lead to serious customer service problems," he said. Avik Roy reveals the depths of the logistical nightmare, explaining that insurance companies would have all of 30 days to reassemble their old products. That effort would include renegotiating 2014 rates with hospitals and doctors; calculating the cost of the revised plans; submitting the plans to the state commissioners and gaining their approval; and finally, re-marketing the plan to consumers. "I haven’t spoken to a single insurance executive who thinks that insurers are going to be able to get all that done," Roy reveals. Mike Kreidler, insurance commissioner for the state of Washington, echoed that concern. "How do you implement something after this is already afoot and insurers made all the changes?" he wondered. "We've been doing everything in our power, working extra hours and burning the midnight oil to get everything set up to implement the ACA here in the state of Washington." Kreidler was the first state commissioner to reject the fix. "I wish things were different," he said. "But if you want this law to work--and I do--then this is what we have to do." Kreidler was not alone. Three other states, Arkansas, Vermont and Rhode Island, have also rejected the changes. Other states took varying positions. Commissioners in Mississippi and Georgia indicated that they would ignore the change. Massachusetts and Montana remained non-committal, while Kentucky, Ohio, California, Florida and Colorado said they support the White House plan. Yet supporting the fix may be a fool's errand. As McCarthy explains, the president's waiver does not negate the fact that ObamaCare remains the law of the land. "Even if it were constitutionally proper for a president to flout Congress in the executive branch’s enforcement practices, all that means is that the Obama administration will give insurers a pass until 2014," he writes. "The Obama 'waiver' does not change what Congress’s law actually says, and therefore it has no bearing on the legal obligations attendant to the relationship between the insurer and the insured." If insurance companies ignore that reality McCarthy envisions a flood of of litigation. First, those with old policies that are still denied certain types of treatment covered by ObamaCare would sue, claiming they were illegally denied coverage to which they are entitled by the current law. After that, the insurance companies would file suit, demanding compensation for the payouts they incurred for issuing the illegal policies. McCarthy notes that Congress could provide the insurance companies with immunity, but only if Congress were involved in the law's re-write. Obama resolutely refuses to let Congress get involved because he knows once that can of worms is opened, major, unanticipated changes could be made to the law. In other words, the president is reduced to assuring insurance companies that he will not enforce the law as written. That would be the same president who told Americans more than two dozen times that if they like their insurance policy and their doctors, they could keep them. So far, 4.2 million Americans whose insurance policies have been cancelled have personally experienced the worthlessness of Obama's assurances. Insurers would be virtually insane to ignore that track record. Even the president's rationalization that "the individual market accounts for 5 percent of the population” (those affected by these cancellations) is also a lie. First, the individual market accounts for 8 percent of the population, or some 25 million Americans. Yet far more importantly, parameters of his fix include the following language: "The specified conditions [include that] the health insurance issuer sends a notice to all individuals and small businesses" (italic mine). That language is in there for a reason. Page 34,553 of the Federal Register, Vol. 75, No. 116 contains a chart showing that between 39 percent and 69 percent of all employer insurance plans will lose their "grandfather" status in 2013, meaning they will be cancelled, exactly as the individual policies have been. Since approximately 156 million Americans get insurance through their jobs, a mind-bending 61 million to 108 million employees will also be receiving cancellation notices. The date of that particular volume of the Federal Register? Thursday, June 17, 2010. That revelation was disseminated by the media long before Obama's press conference last Thursday. Perhaps that is why Sen. Kirsten Gillibrand (D-NY) admitted that she and her fellow Democrats were long aware of the reality that millions of Americans would have their plans cancelled. When ABC’s This Week fill-in host Martha Raddatz, asked Gillibrand whether Democrats were misled by the president, she initially dodged the question. When Raddatz pressed the issue, Gillibrand was blunt. "No, we all knew," she responded. As bad as that is revelation is, the hits just keep on coming. Last week, Obama administration officials finally conceded that "in many cases," plans offered on the exchanges are more expensive than those offered prior to the implementation of ObamaCare--even when the subsidies are included. "Although affected individuals and small businesses may access quality health insurance coverage through the new Health Insurance Marketplaces, in many cases with federal subsidies, some of them are finding that such coverage would be more expensive than their current coverage, and thus they may [be] dissuaded from immediately transitioning to such coverage," wrote Center for Consumer Information and Insurance Oversight director Gary Cohen. Once again, like his other promise to Americans, here is a video montage of the president insisting his plan would lower insurance premiums by up to $2500. And once again, here is Obama "readjusting" his language last Thursday. 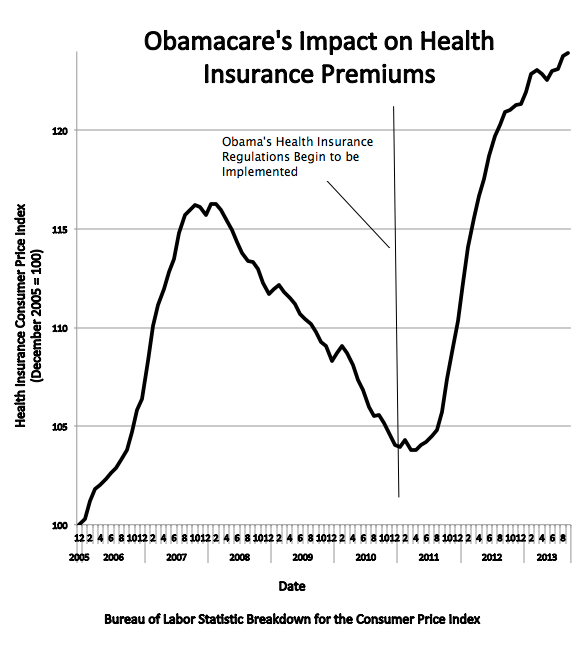 "We will continue to make the case, even to folks who choose to keep their own plans, that they should shop around in the new marketplace because there’s a good chance that they’ll be able to buy better insurance at lower cost.” A graph showing the virtually uninterrupted rise in the Health Insurance Consumer Price Index suggests otherwise. So does reality that insurance experts are warning Obama's fix could push premiums even higher, as a result of the aforementioned logistical nightmare. Further "readjustments" are in the offing as well. Incredibly, government officials told the Washington Post Sunday that the Obama administration will label the federal insurance marketplace a "success" if 80 percent of its users can buy plans online. The Post notes that number is "an internal target that administration officials have not made public." No doubt they're waiting for November 30, when the healthcare.gov website is expected to be fully functional. Thus, much like the dishonest signup numbers released last week that counted those with policies in their virtual shopping carts as fully enrolled in a plan, a "successful" website will be defined as one which leaves one-in-five Americans in limbo. Add to the mix scam websites and navigators, thousands of doctors being dropped from plans that can no long afford them, a dearth of signups by younger, healthier patients critically necessary for ObamaCare's survival, and a series of devastating poll numbers regarding both the president and his so-called "signature achievement," and it becomes clear that the president's "fix" is about nothing other than fixing his political fortunes and those of his party. Furthermore, Democrats' lack of faith in Obama's efforts to undo the damage is reflected in the 39 House Democrats who supported a bill sponsored by Rep. Fred Upton (R-MI) aimed at reversing the insurance cancellations, and the one sponsored by Sen. Mary Landrieu (D-LA). Landrieu's bill is more indicative of the discontent, since it was sponsored in the Democratically-controlled Senate, and might allow consumer to keep their old plans indefinitely. All in all, ObamaCare remains what it has always been: an unmitigated disaster, enabled by an avalanche of lies and a conspiracy of silence by Obama administration officials and Democratic representatives. Obama’s “fix” can’t negate that reality. Don't miss The Glazov's Gang's recent episode, ObamaCare’s Dirty Little Secret.